our business depends on successful debt collection. 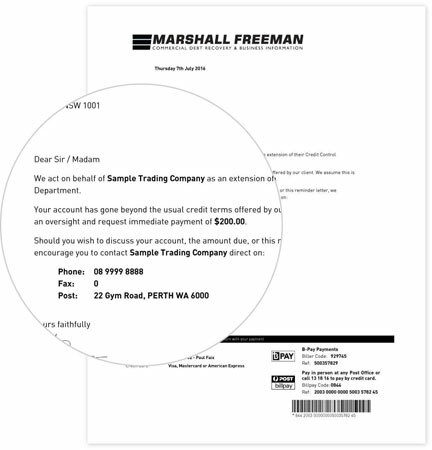 Marshall Freeman is Australia's leading commercial debt collection company, offering Australian businesses cost-effective and results driven debt collection solutions. With over 15 years' experience and trusted by over 20,000 businesses, we are Australia's preferred commercial debt collection agency. Our expert team of specialists are trained and dedicated to making sure your overdue is a priority so that you get paid fast. We combine the latest technology and recovery techniques to minimise overdue accounts and prevent bad debts at minimal cost to you. We offer a stress free collection process to all businesses - large and small, whilst maintaining the highest standards of customer service to safeguard your business relationships. If you're looking for a commercial debt collection agency that gets results, please get in touch as our experience has shown we are able to collect debts most other collection companies write off. Excuses are overcome and disputes resolved. Our 2 step slow payer system empowers you to collect your own accounts prior to lodging with us. If your customer pays there is no commission! THIS ACCOUNT IS NOW OVERDUE. Marshall Freeman Collections for recovery. Generate and print your own reminder letters using our letterhead. "Our customer walked in off the street while I was at lunch and paid her debt in full!!!. I don't know what you said to her but it must have been very effective!!" Staff receive specialised training to understand local laws. We comply with government regulations including privacy act. Maintain a professional, firm approach at all times. Trusted by 20,000+ Australian & New Zealand companies. Thank you for your enquiry. An expert consultant will contact you within 1 business day to discuss your options. Marshall Freeman has been rated 4.8 out of 5 - based on 25 client reviews.